The first of 70 new Amtrak Cities Sprinter locomotives—known as the ACS-64—was unveiled on Thursday, February 6, 2014 at Philadelphia 30th Street Station. During a ceremony held in the historic North Waiting Room, Vice President Joseph R. Biden, U.S. Secretary of Transportation Anthony Foxx, Amtrak President and CEO Joseph Boardman and Siemens USA President and CEO Eric Spiegel spoke about the importance of the new locomotives, which will help power the economy of the greater Northeast and usher in a new era of improved reliability, mobility and connectivity for intercity rail passengers. The next day, locomotive No. 600 entered regular revenue service on the Northeast Corridor (NEC), pulling Northeast Regional train No. 171 on its way from Boston to Washington. Amtrak, Siemens and federal officials cheer as ACS-64 No. 601 passes them during a test run. The ACS-64 is the latest in a long line of distinguished electric locomotives, such as the GG-1 and AEM-7, that have carried passengers in the Northeast since large sections of the rail corridor were electrified in the 1930s. Constructed by Siemens at its plant in Sacramento, Calif., parts for the new locomotives come from approximately 60 suppliers in more than 20 states. Amtrak expects to have several more new locomotives enter revenue service in the coming weeks and then will receive monthly delivery of the remaining units through 2015. Designed to run at speeds up to 125 mph, the dual-cab locomotive has a peak 8600 horsepower. A regenerative braking system can feed up to 100 percent of the energy generated during braking back to the power grid. A state-of-the-art microprocessor system performs self-diagnosis of technical issues, takes self-corrective action and notifies the locomotive engineer. In addition, there are redundant systems to ensure power is maintained to the passenger cars to keep heating and cooling systems working, the lights on and the doors operational. 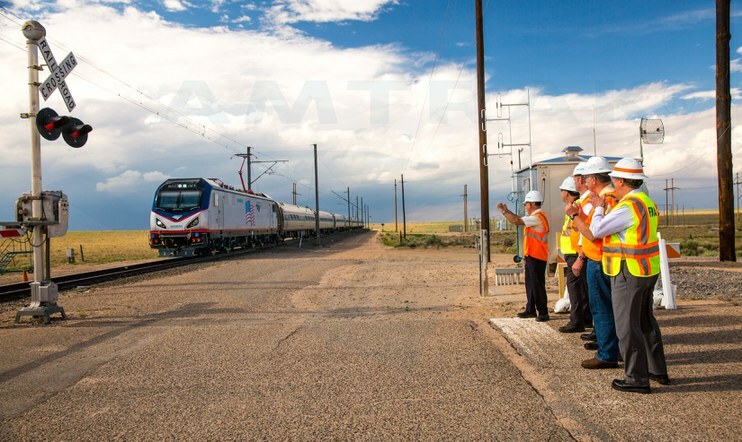 The locomotives also meet the latest federal rail safety regulations, including crash energy management components. Ultimately, this improved technology leads to a more energy-efficient locomotive fleet and significant cost savings. Engineers must go through specialized training before they are allowed to operate the ACS-64. This includes eight hours of classroom time as well as hands-on experience in the cab to become familiar with the various digital displays and their readings. Once this is completed, engineers take a “check ride” with a Road Foreman of Engineers who ultimately decides if the engineer is ready to operate the locomotive in regular revenue service. Visit the Amtrak Blog to learn more about the training program. To mark the arrival of the ACS-64s, we thought we’d take a look back at the unveilings of our most recent locomotives, including the AEM-7, Genesis Series and the Acela power car. For more than a decade, these designs have largely defined the Amtrak fleet for travelers and rail fans across the country. By the late 1970s, Amtrak was in need of a reliable, lightweight electric locomotive that would allow the company to phase out the GG-1s. Built for the Pennsylvania Railroad in the 1930s and 1940s, these iconic units were simply approaching the end of their useful lives. The new locomotive would also supplement the fleet of electric E-60s, ordered in the mid-1970s. Although intended to replace the GG-1s, they had proved too heavy and were limited to maximum speeds of 90 mph. The Swedish Rc4 influenced the design of the Amtrak AEM-7. The company tested two foreign prototypes in 1976 and 1977: the Swedish Rc4, designed by Allmanna Svenska Elektriska Aktiebolaget (ASEA), and the French CC 21000 built by the Société Nationale des Chemins de fer Français (SNCF). 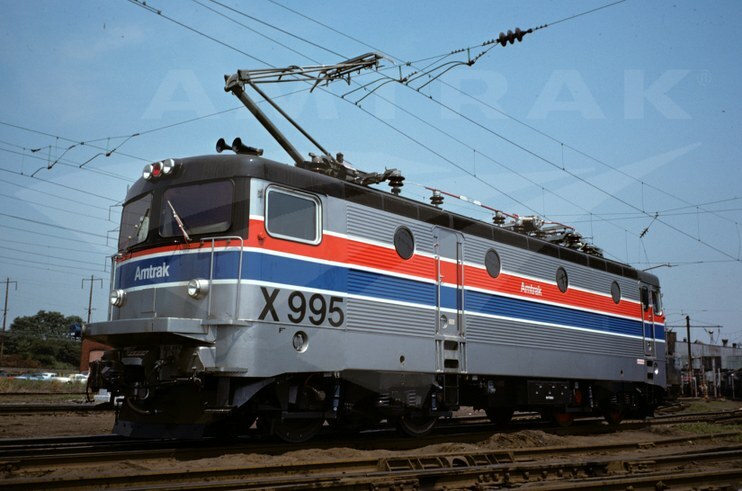 During their trial period on the NEC, Amtrak designated the units x995 and the x996, respectively. ASEA’s Rc4 won out and became the basis for the Amtrak dual cab AEM-7, produced from 1978 to 1988. 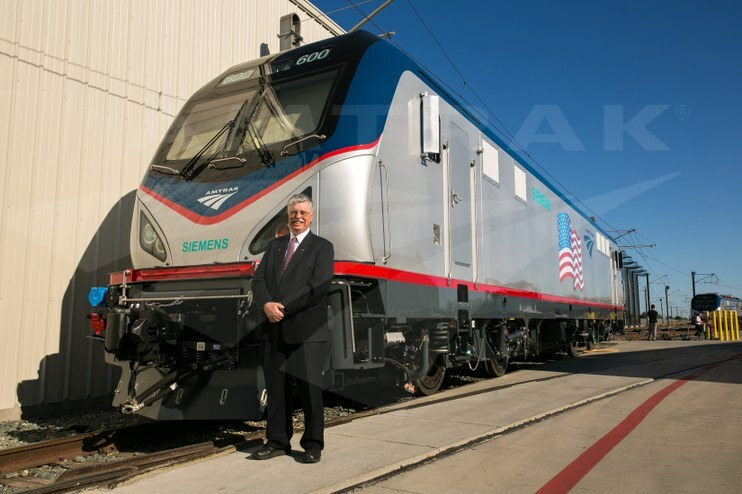 Amtrak contracted with the General Motors Corporation Electro-Motive Division (EMD) to design and manufacture 54 of the 101 ton locomotives, and the first units have car bodies built by Budd. Each has 7000 horsepower and can achieve top speeds of 125 mph. Among railroad fans, the locomotive is affectionately known as a “Swedish meatball” or “toaster” due to its country of origin and compact, boxy design. 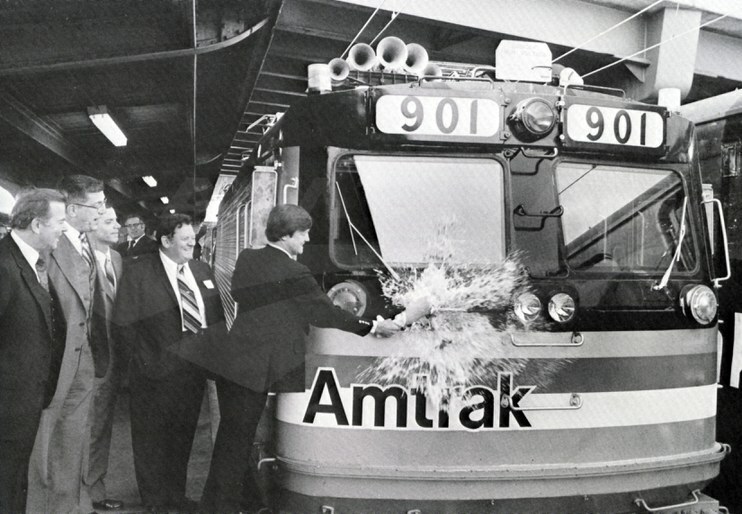 On May 9, 1980, dignitaries gathered at Washington Union Station to mark the entry of the first AEM-7 into revenue service. Congressman Robert W. Edgar, whose district included part of southeastern Pennsylvania, christened locomotive No. 901 with a bottle of champagne while officials from Amtrak, ASEA, EMD and the Federal Railroad Administration looked on. Following remarks from the assembled group, the locomotive pulled out of the station, leading Metroliner Service Train. 108 on its run to New York. As indicated by its original name, AMD-103 (standing for Amtrak Diesel, 103 mph), the locomotive could reach 103 mph. To reduce the unit’s weight for greater fuel efficiency, GE employed a monocoque body “in which corner posts and overhead cross members provide 40 percent of the tensile strength.”4 For ease of maintenance and repair, the locomotive shell employs only flat surfaces, rather than more complicated curves. 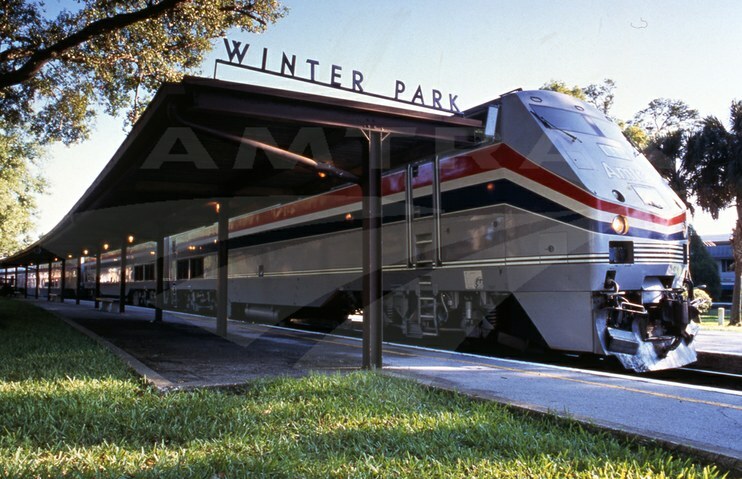 A P-40 stopped at the Winter Park, Fla. station. One of the most advanced features of the AMD-103 was its integrated function control—on-board microcomputers that “constantly monitor propulsion, braking, engine speed, head-end power requirements and other data fed into them by probes from around the locomotive.”6 Engineers in the cab monitored a series of computer screens displaying key information about the locomotive’s systems. With input from the Federal Railroad Administration/Association of American Railroads Cab Committee and members of the Brotherhood of Locomotive Engineers, the cab included an efficiently organized engineer’s desk and comforts such as sound-deadening insulation and air conditioning.7 Engineers were given extensive training so they would be comfortable with the new technologies and arrangement of the controller’s console. Amtrak ordered 52 AMD-103s—42 4000 horsepower locomotives and ten of the third-rail compatible units. Before they were introduced into wide circulation, the locomotives were renamed the Genesis-Series 1 in recognition of the machine’s clear break from past designs. The name was chosen through an employee contest at the GE plant in Erie, Pa.8 Although the Genesis name stuck, the 4000 horsepower locomotive is now more commonly referred to as a P-40, while its mate is called a P-32-AC. The California Zephyr, led by P-42 No. 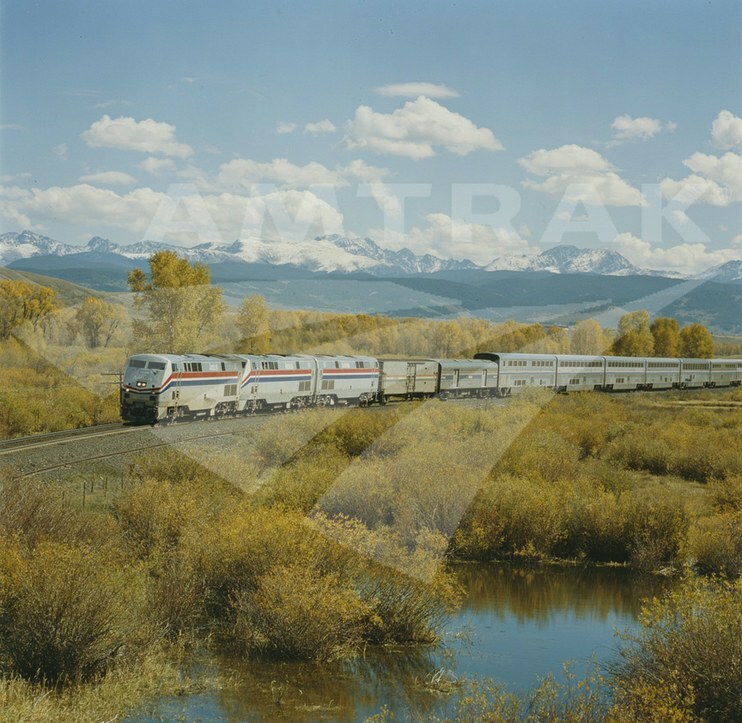 57, passes near Granby, Colo.
Amtrak introduced the P-40 at an event held at Washington Union Station on May 11, 1993, when No. 803 was shown to the press. The following month, the Auto Train became the first train to employ P-40s.9 In 1996, Amtrak purchased 98 more Genesis locomotives for $235 million, but the horsepower was increased to 4250 for a top speed of 110 mph—thus the locomotive is known as the P-42. Today, there are approximately 200 P-42s in service across the country. The last significant locomotive to enter service was the electric power car included as part of the Acela Express train sets designed and manufactured by a consortium of Bombardier and Alstom. Each of the 20 train sets includes six passenger cars between two power cars at each end. Measuring almost 70 feet long, 10.5 feet wide and 14 feet, eight inches high, the power car has 6169 horsepower and is capable of reaching speeds of 150 mph over current NEC infrastructure. To prepare for the arrival of high-speed rail service in 2000, the northern end of the NEC between New Haven and Boston was electrified, which included the installation of catenary poles, wires and electrical substations. Amtrak opened its High-Speed Rail Training Facility in Wilmington, Del., in 1999 to train employees assigned to the Acela Express. It houses a full-scale motion simulator that duplicates the experience of operating Acela Express trains from inside the cab, an on-board service-training lab complete with seats, tables and food preparation areas, and nine classrooms. Over the next few months, the simulator will be reconfigured to also allow for ACS-64 training. The inaugural Acela Express pulls into Boston South Station. Intended to compete with airlines for travelers in the Washington-New York and New York-Boston markets, the service launched with a special VIP trip on November 16, 2000. Before the departure, Governor Tommy G. Thompson of Wisconsin, then-chair of the Amtrak Board of Directors, christened the train with the prerequisite bottle of champagne. In the background, a fife-and-drum corps pepped up the crowd with patriotic selections. Once the speeches were concluded, guests boarded the train to experience a non-stop trip to New York in two hours and 28 minutes. 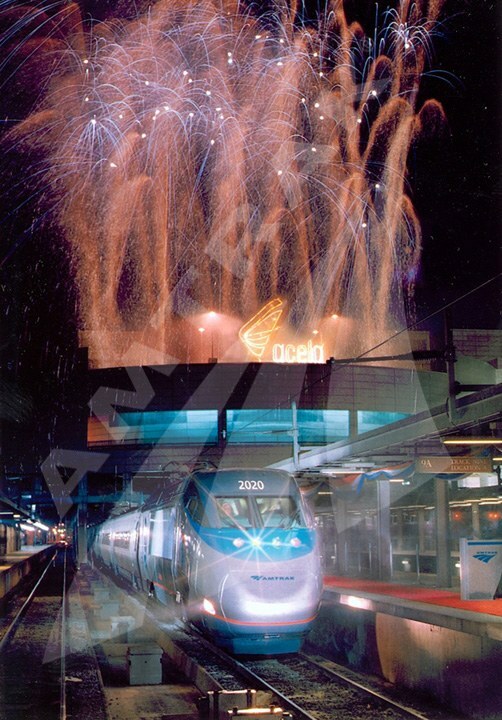 A reporter for The New York Times described the Acela Express as “part airliner and part living room…quiet enough for a six-man a cappella group, Vocal Tonic, of Atlanta, to perform clearly in the aisles…”10 Touring the cabin, he called it “positively supersonic, with electronic screens like those in jetliners.”11 Colorful fireworks lighted the night sky as the train pulled into Boston South Station that evening. A new era in North American high-speed rail had begun. 1“Make way for the Genesis Series,” Trains Vol. 53, No. 8 (August 1993). 2Bob Johnston, “Genesis: Amtrak’s new breed,” Trains Vol. 53, No. 9 (September 1993). 10Matthew L. Wald, “High-Speed Train Makes Flashy Debut,” The New York Times, November 17, 2000.